Good use of your conference room space can help your employees be more productive and creative when working in teams. Your conference room needs to utilize good design, comfortable office furniture, and the proper equipment for your employees to feel comfortable and to enhance teamwork. Consider the following do's and don'ts when creating your office's conference space. Do you spend more than 6 hours at your work desk? Do you normally experience pain (in the back, shoulders and neck) at the end of the day after leaving from work? Maybe you need to change the chair you use at work. PTIOF provides tips on how to create the perfect desk setup in your office, home, or wherever work may take you. What's more painful than a Monday morning or a lack of caffeine? Although these are pretty dreadful, that's probably not the worst thing that could happen. I'm talking about going into the office, sitting behind a desk for a full 8 hours attempting to fight the urge to sleep due to a to a lack of motivation and a bland working space. It might seem a bit strange. From cleaning the kitchen to clearing a path in the playroom, working mothers are always organizing something. However, our offices are our private spaces. Here, we can become relaxed and disorganized. It's a space that won't end up with a trail of goldfish crackers on the rug or small toys stuck under the seat cushions. So why keep it clean? Your career is impacted by clutter! And decluttering it isn't as hard as you think it is. Purge and clean your office in small steps over five days so it doesn't feel overwhelming. Here's how to do it. A filing cabinet is a quintessential commodity of your office, study or workplace. 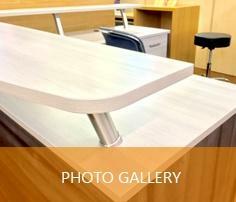 Intrinsically, it is a part of office furniture that is used to store files, paper documents, brochures, forms, etc. in an organized and hassle-free manner. In many shapes, it is considered to be an enclosure for drawers, used for storing different types of documents and files. Whether you're opening a new business, or making the decision to expand your established business, calculating all of the costs associated with the project can be overwhelming. That's why more and more people are turning to used furniture to save money when furnishing their offices. Whether you're running a small business or a multi-million-dollar corporation, PTIOF of Bergen County encourages every office to save money wherever possible. Although saving money may be necessary, it's important to plan wisely when budgeting for your new office furniture — some pieces are worth the splurge. Choosing a filing cabinet is a little more in-depth than just saying, "Ooh… that one looks pretty!" Why? It has to be a functional object as well; a well-made filing cabinet makes the job of filing incomparably easier than a pretty but poorly-made one. Here's what to look for. An ergonomic office chair is a tool that, when used properly, can help one maximize back support and maintain good posture while sitting. However, simply owning an ergonomic office chair is not enough - it is also necessary to adjust the office chair to the proportions of the individual's body to improve comfort and reduce aggravation to the spine. 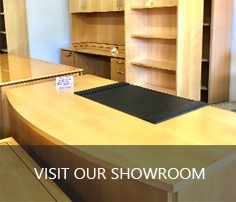 There's a lot more that goes into buying office furniture than meets the eye. You may think you have the basic down, but there are some office furniture mistakes that you could be making. PTIOF informs its customers on the biggest mistakes you can avoid when buying office furniture. If browsing and purchasing office furniture from the comfort of your desk seems too good to be true, there's a reason for that: it can lead to costly mistakes and create more problems than it solves. Online retailers may offer many attractive purchasing options, but the truth is that buying office furniture sight-unseen is risky and ultimately not worth the apparent convenience. Before you even consider outsourcing the supply of furniture to your office, start by defining the functions and how your office space will be used. Based on the layout of your office design, determine the kind of furniture and other accessories that you will need to accommodate your office functions. Ask yourself whether you will be using computers with wide monitors or will you be working on slim laptops and tablets that tend to occupy less desk space? There are several things you should keep in mind when looking for secondhand office furniture, including cost, comfort, and size. These factors can help a business decide on the best-used furniture to buy, depending on your particular needs. Allow PTI Office Furniture of Bergen County to help your business make the most out of your next experience when shopping for used office furniture. You are standing in the store, pondering whether or not to pick up that shiny executive office chair to add to your business. Congratulations – you are halfway there. But before you make that decision, allow me to make a suggestion. One great way to get the best bang for your buck is to go for refurbished, secondhand equipment as opposed to new ones. But enough blubbering: here are the main reasons companies should buy used office furniture over new ones. When considering office waste, it's natural to think about materials such as wasted paper, or even the amount of electricity used to maintain function technology. But, these numbers might make you second guess the whereabouts of your office furnitures after-life. Direct Health Solutions carried out a survey last year that found absentee levels are rising. They estimated the cost of absences at over $3600 per worker each year. While the reasons for absences are varied, at least some of those absences can be explained by conditions created by our workplaces. PTI encourages is customers to consider these tips on how to make your office more ergonomic! Starting a new business is exciting for every entrepreneur. Don't forget to consider what your new office space may require for maximized productivity including budget, space, lighting and comfort. Having the ability to work from home has its pros and cons, but if your boss allows (and you plan correctly), you can make big advances. PTI Office Furniture provides tips that can maximize productivity while working from home this summer. Whether you're running a business from home and need an expansive office space, or if you just want a place where you can focus from time to time when you work from home, you can set up a home office that's perfect for you! These five steps will help you transform your space and create the home office of your dreams. If you've been at your job for a while or have been meaning to move up the ladder, now might be the time to change your desk setup. The right workspace just could boost your career.